India’s biggest tax reform the GST has created ripples in India’s unwieldy $2 trillion economy. According to a recent survey conducted by International Federation of Accountants, 64% of people believe that GST implementation has brought wide-ranging disruption to Indian businesses. Why? Indian businesses are not only facing an avalanche of paper work but are also ill prepared to meet online compliance needs of indirect taxation. So what can companies do to ensure end-to-end GST compliance while focusing on business priorities? Enter Inspirria’s Indian Taxation Bundle. Leveraging the capabilities of NetSuite's SuiteCloud Computing Platform, the SuiteApp enables businesses to automate Indian taxation statutory reporting, CGST, SGST and IGST calculation. The result: enhanced GST compliance and reduced costs. Ensuring financial compliance through manual processes is cumbersome and time consuming. For companies looking to enhance accuracy and financial compliance and significantly reduce manual processing, Inspirria Indian Taxation Bundle is the answer. It not only helps eliminate manual financial consolidation and reporting but also seamlessly integrates all transactions to meet Indian localization requirements. With the SuiteApp, companies can easily automate Indian taxation statutory reporting as well as VAT, TDS, and service tax calculation. The solution also automates Indian subsidiary taxation for NetSuite one-world customers. As businesses transition from a complex central indirect tax structure to GST, tax reporting has become a dire challenge. Inspirria Indian Taxation Bundle helps enhance agility and meet GST reporting needs such as defining GST registration details at different entity levels, and capturing tax details at the customer and vendor level. You can also easily integrate purchase orders, vendor bills, sales orders and invoice with NetSuite, and enable format support for schedule VI of balance sheets. In addition, the SuiteApp helps define various types of taxes, input and output posting, as well as configuring tax codes. For companies with Netsuite or those planning a Netsuite implementation, integrating Inspirria’s Netsuite Indian taxation solution is a great way to enhance GST compliance. The powerful combination of NetSuite ERP and Inspirria’s Indian taxation Bundle helps drive significant outcomes: seamlessly run back office operations and develop exceptional financial management capabilities such as sophisticated revenue management and billing for superior business growth and innovation. In an increasingly demanding global environment, managing tax responsibilities and planning for tax issues is becoming more complex than ever before. Leveraging technology to comply with complex tax structures is critical to business health and success. Inspirria’s cloud-based automation solution is a step in this direction. It is specifically customized to meet Indian taxation requirements and is designed to reduce the errors and enable better decision-making with round-the-clock support. 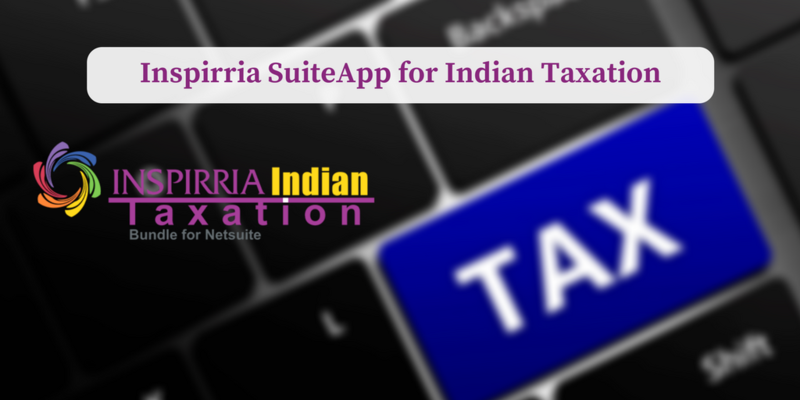 Inspirria is a leading provider of Indian Taxation Bundle, a SuiteApp for Netsuite offering comprehensive automated solutions to wide-ranging clients. We leverage proven methodologies and the expertise of our team members to help you easily integrate our Indian taxation bundle with Netsuite, driving superior outcomes.